For unbeatable bathroom remodeling and design services in Tampa, Lutz, Westchase, and the many surrounding Florida communities, be sure to turn to KitchenAlity. 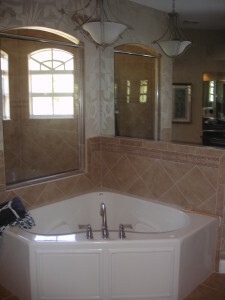 Yes, our name implies expertise in kitchen remodeling, but we also have a passion for beautifying bathrooms for homeowners throughout the Tampa Bay area. Before the bathroom remodeling work begins, we will first sit down with you to discuss everything you’d like to have in your new bathroom. Then, we will turn those ideas into a feasible design plan for you to review. And you won’t be reviewing just any design plans, but ones presented to you as a 3D rendering, allowing you to envision precisely how your new bath will look when renovations are completed. When, and only when, you have approved the final design will we begin to bring it all to life for you. To find out more about the team at KitchenAlity and the professional bathroom design and remodeling services that we can provide for you in Tampa, Lutz, Westchase, or any nearby community in FL, please contact us today. We’ll be happy to offer a free consultation with you, right in the comfort of your own home.